Sunday November 30th 1890 It was a threatening but did not storm. Mother came over before dinner. We read in the afternoon and I went down to the bridge with her on the way home. Will milked this evening. And after supper we worked till bed time on the books. Monday December 1st 1890 Ott is thirty one years old today. Will looked after the work at the barn this morning. We got washing done and house all cleaned up before noon. I was over town in the afternoon and out to Fannys. It was a nice day. Will and I worked all the evening to finish up our books. Lee is home. Tuesday December 2nd 1890 We got the ironing done before noon and the usual morning work done. I went to town with Will in the afternoon to get him a suit of clothes. I walked down to Hatties but had only been there a little while when he came after me as it was snowing. we came right on home. I was knitting in the evening. I baked bread today. Wednesday December 3rd 1890 Will took his clothes back and changed them before noon and I was most of the afternoon mending his working clothes and changing the vest to his new suit. I cut out two night shirts for him in the evening. weather wintry. Thursday Decmeber 4th 1890 It was a cold day I was at home all day sewing on Wills shirt. Anna done the most of the house work. 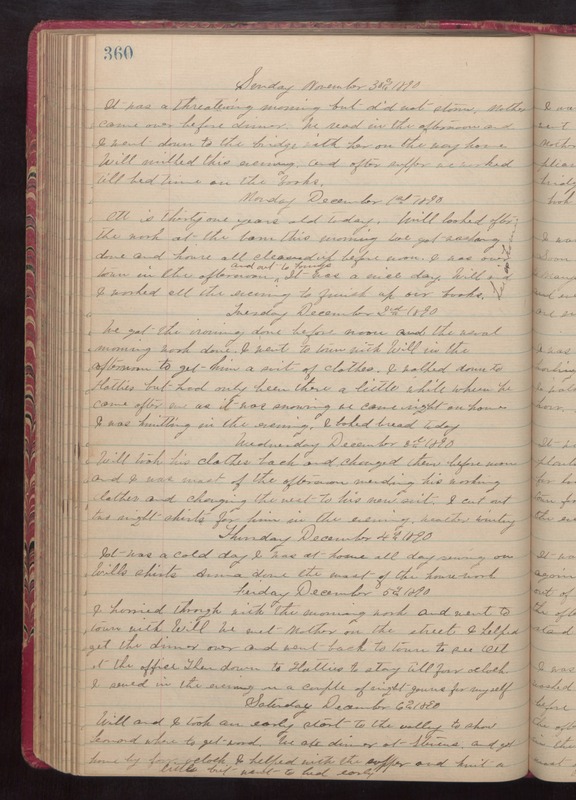 Friday December 5th 1890 I hurried through with the morning work and went to town with Will. We met Mother on the street. I helped get the dinner over and went back to town to see Ott at the office then down to Hatties to stay till four oclock. I sewed in the evening on a couple of night gowns for myself. Saturday December 6th 1890 Will and I took an early start to the valley to show Leonard where to get wood. We ate dinner at Stevens and got home by four oclock. I helped with the supper and knit a little but went to bed early.